This traditional facial bed has thick foam foot, seat and backrest cushions which are covered with a comfortable PVC vinyl material for years of durability. Its lightweight design provides all the comforts of a large bed but also provide complete flexibility. It features a face cut-out pillow and fully removable armrest. It also has adjustable head, back and leg rests; the back of the chair is adjustable upward for customer comfort, and the footrest is adjustable downward. 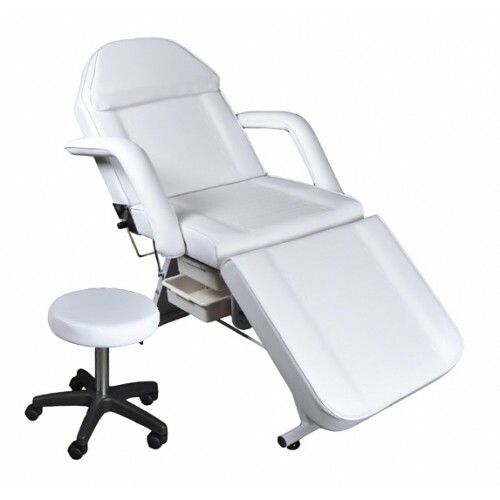 This is truly a very versatile facial table and is ideal for facials, skin care, massage, tattooing, or body piercing.